We could not agree more. We are also a starting point for parents introducing their children to the pleasure of reading; a resource for folks returning to gain valuable skills or expand their horizons; a hub, sorting and providing information on issues local, national and global; a lifeline to jobseekers and homework doers; and a service to those whose love of reading is measured in decades. On Legislative Day, as always, we greeted our senators and representatives with sincere gratitude. Since 1983, the Ohio General Assembly has remained committed to supporting Ohio public libraries through the Public Library Fund (PLF). This commitment has waxed and waned with administrations, state budget needs, and periods of economic downturn and growth. Libraries depend on state funding. In fact, an average of 95 percent of our library’s total revenue comes solely from the PLF. Post-recession, our local library is funded with amounts that mirror those from 20 years ago. Because of this continued commitment from the state, however, (and certainly because Ohioans just love their libraries) Ohio public libraries are top in the nation, with more than 84 million library cardholders statewide! Our “Year in Review” tells this same story. 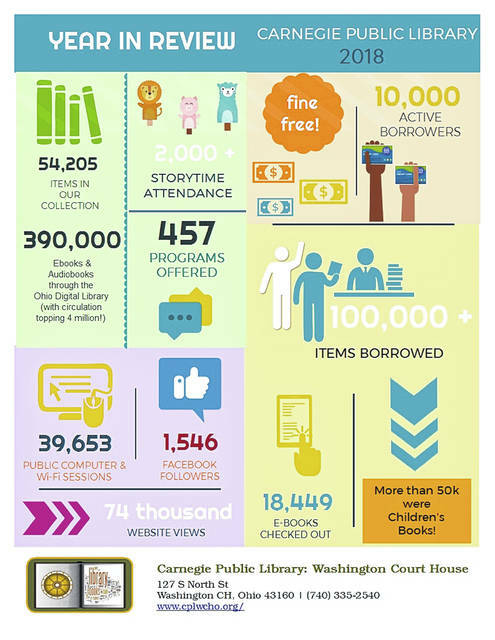 In Fayette County alone, Carnegie Public Library served more than 10,000 active library card holders who borrowed more than 100,000 items in 2018. We offered nearly 500 programs last year, including four storytimes a week, and informational and cultural programs for adults and children of all ages. From our shelves, the Ohio Digital Library collection, and the SEO Library Consortium, cardholders have free access to countless books, movies, magazines, microfilm, genealogical resources, online learning tools, digital books and audiobooks, and more. Our library is fine free, provided more than 39,000 computer and Wi-Fi sessions, and circulated more than 18,000 e-books last year. Beyond these walls, we partner with local agencies to enrich and enhance mutual services and serve Fayette County’s unique needs and populations. It is our pleasure to serve Fayette County and share our story with lawmakers, fellow librarians and you! Sarah Nichols is the director of Carnegie Public Library.